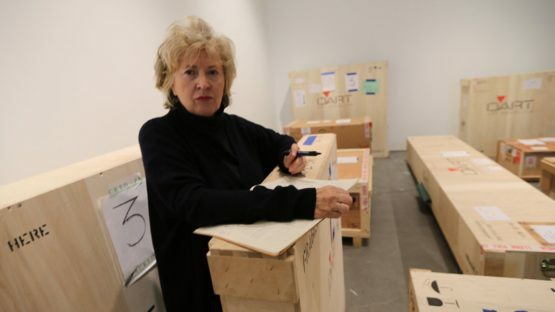 Rosemarie Trockel is one of the most influential German contemporary artists, internationally renowned for her complex and controversial works. Her oeuvre is quite diverse in themes and mediums, which include works on paper, knitted paintings, and sculptures. Trockel’s artworks are very challenging and it is not easy to associate a particular artistic style with her innovative gestures: she often addresses feminist issues through her art, as well as challenging breakthrough theories of sexuality, culture, and artistic processing. Although her pieces are clearly versatile, Trockel became best known for her unique knit paintings made of machine-woolen materials stretched onto fabric. Rosemarie Trockel was born in the early 50s in Schwerte, Germany. She attended the university from 1974 to 1978 at the Werkkunstschule in Cologne. During her school days, talented young Trockel has already shown an undeniable interest is the grotesque and the unusual and majority of her early artworks were influenced by the later forms of surrealism. Another major influence when it comes to Trockel’s art study was Joseph Beuys – many art critiques agree on the fact that Trockel’s wild imagination without any limits resembles Beuys’s style. Trockel is known to experiment with many mediums, such as film, video, ceramics, drawings, and collages, which emphasizes the strength of Trockel’s talent. 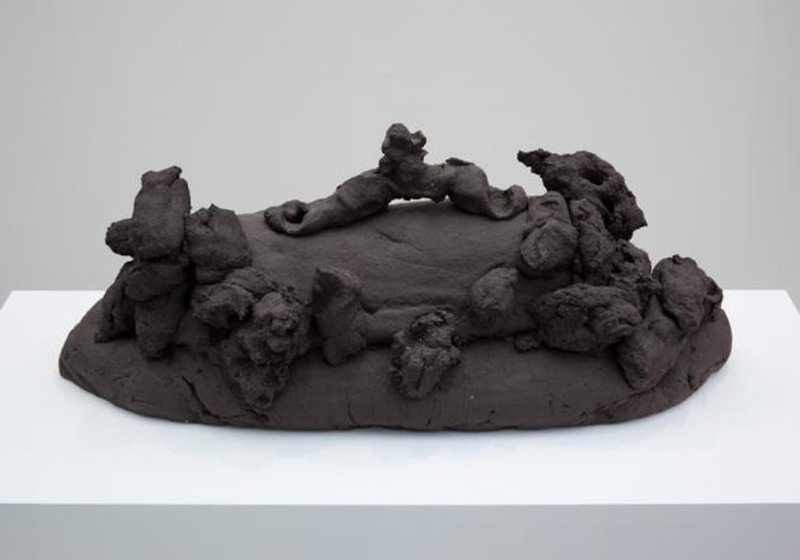 In addition to her works in film, ceramics, and drawings, a lot of Trockel’s pieces represent innovative sculptures done in an array of different materials. In the early 1980s, Trockel became an active exhibitor and her first solo shows were held at the Cologne gallery of Monika Sprüth, which was famous for showcasing only female artists. Since the German art scene at the time was dominated by male artists such as like Joseph Beuys and Gerhard Richter, Trockel’s presence was really refreshing and daring at the same time. Ever since the beginning of her career, Trockel showed her love for addressing controversial issues of sexuality, feminism, as well as the hierarchy of the political and social systems. While it is true that Trockel’s style can’t be easily categorized due to its complexity, we can still find a number of recurring themes and motifs throughout her oeuvre. The most common themes are notions of female identity, feminism, also the relationship between fine art and craftsmanship as well as the presence or anonymity of the artist traceable in his artwork. During the 70s, the artist started addressing various contemporary concerns, such as the place of a female artist in the art world. Her work has constantly challenged many complex concepts of sexuality, culture, and artistic processes.Her installations and sculptures are often large-scale, which defies many stereotypes related to female art. In the 1980s, Trockel’s art has reached an international appraisal and she started organizing important solo shows in the United States, for instance at the Museum of Modern Art (MoMA) in New York. When it comes to Trockel’s use of various materials, wool is considered one of her signature choices. 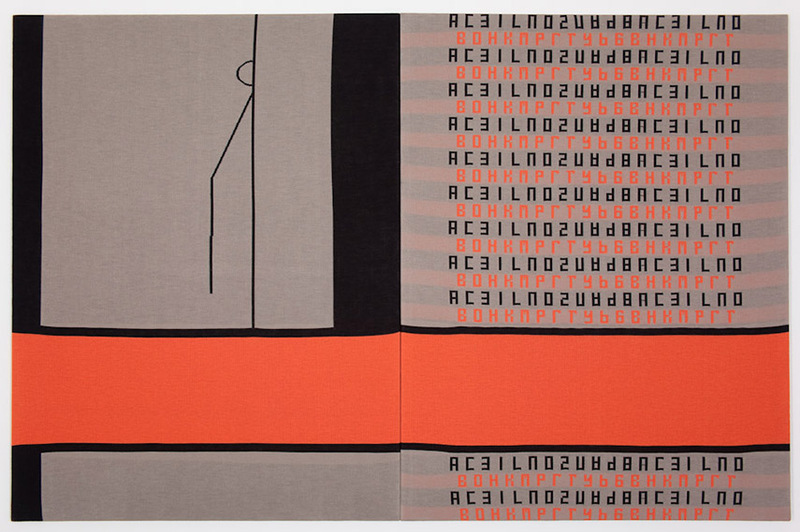 Rosemarie Trockel has created a famous series of machine-knit wool works in the 1980s. B 1985, she came to a brilliant idea to stretch these woolen materials onto frames.The woolen pieces she is famous for are not any regular embroidery- instead, her materials are patterned with computer-made geometrical motifs, or with famous logos, such as the hammer and sickle, which is the widely-known motif of the Soviet Union. Trockel’s series from 2011 called I See Darkness (2011) is her most revered series featuring wool. In these pieces, a black yarn is stretched across a square of white Perspex. Which creates the illusion of a black and white painting. 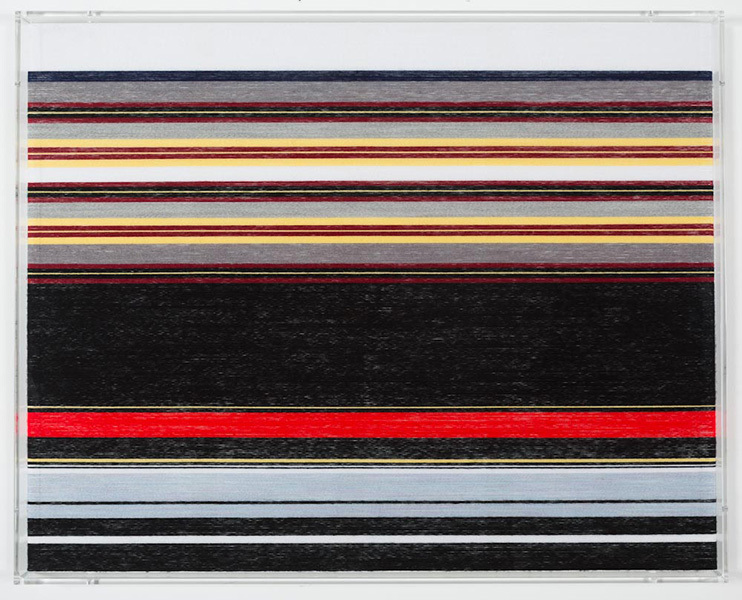 Trockel’s more recent wool paintings, from 2013, combine horizontal and vertical stripes of color, resembling the formal compositions of twentieth-century abstract painting. Talking about Trockel’s sculpture, her best-known piece consists of a steel cube with six plates in two parallel, diagonal lines. This piece is conceptual and it represents an improvised bridge between the feminine and masculine realms of industrial production. Another interesting sample of Trockel’s work is her series of pictures of cobwebs, made by spiders under the influence of LSD, hashish, or mescaline. The artist claimed that these altered webs depict loneliness and defeat of spiders because their webs couldn’t catch prey they needed to survive. This unique spider series is the part of the permanent collection of the Museum of Modern Art in New York. Trockel’s piece from 1990 called Painting Machine and 56 Brush Strokes is as unusual as her artwork featuring cobwebs. This artwork is a one-of-a-kind mechanical contraption consisting of intertwined wires, steel rollers, and 56 paint brushes. The brushes are made of human hair belonging to the legendary artists such as Cindy Sherman and Barbara Kruger. Starting from the late 1980s, Trockel’s interest in woolen pieces has decreased and she became passionate about video works. In her video project called Naples, large flocks of birds rhythmically move across the screen, Ants focuses on movements of a single insect. Trockel’s video from 2003 called Goodbye Mrs. Monipäer features a group of people who contemplate artworks in a modern house. Consequently, they appeared framed and behind glass themselves, because of the aesthetics of modern architecture. This piece is rather interesting in a conceptual sense and it resembles the idea of a metatheatre, normally used as a literary technique. Since 2004, the medium of collage has also become an important part of Trockel’s oeuvre. Rosemarie Trockel has collaborated with many artists, and has been the subject of numerous solo exhibitions, including those held at the Institute of Contemporary Art in London, England, the Museum of Modern Art in New York, NY, the Museum of Contemporary Art in Chicago, IL, the Institute of Contemporary Art in Boston, MA, Kunstmuseum in St. Gallen, Switzerland, the Moderna Museet in Stockholm, Sweden, The Drawing Center in New York, NY, and Kunstmuseum Basel in Basel, Switzerland. In 2012, her art was featured in a major retrospective exhibition called Rosemarie Trockel: A Cosmos, which was held at the New Museum in New York. After the enormous success of the initial show, in 2013 this exhibition has traveled to the Serpentine Galleries in London. 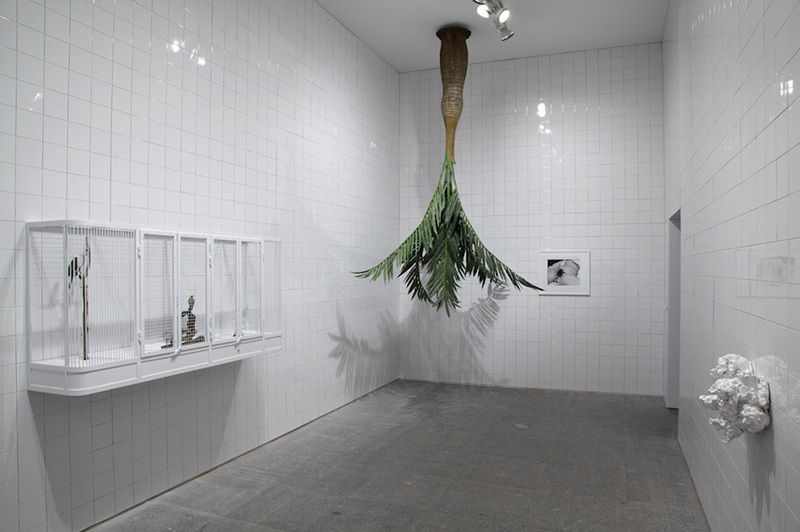 During the same year, another retrospective of her entire work, with wool pictures, ceramics, foam sculptures and collages was held at the WIELS Contemporary Art Centre in Brussels. 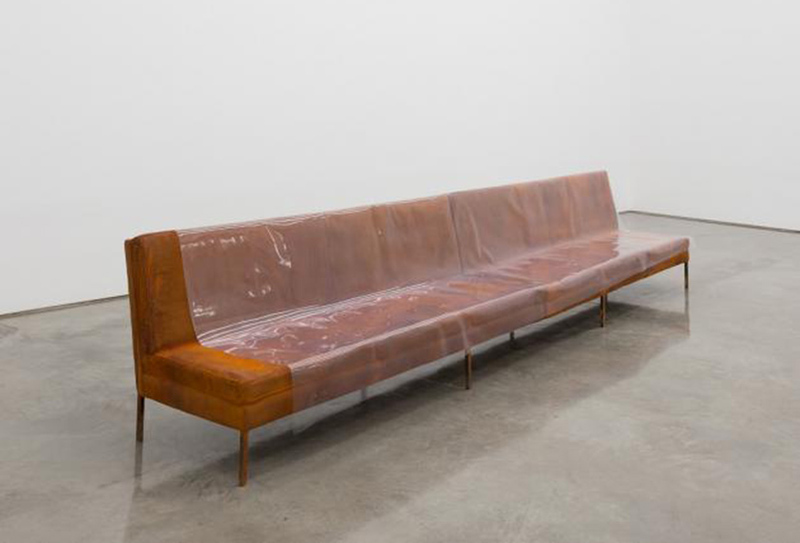 In 2014, Trockel’s pieces were included in the exhibition called Fiber Sculpture: 1960-Present, held at the Institute of Contemporary Art, Boston.When it comes to her most influential and largest commissions, in 1995 Trockel has created the Frankfurter Engel memorial in Frankfurt, Germany. Two years later, in 1997, she has installed her piece called A House for Pigs and People in Kassel, Germany.In the late 90s, together with Thea Djordjadze, Trockel designed Image Movement, which is a film shop and cinema space within Sprüth Magers’ gallery in Berlin. More recently, in 2009, Trockel has designed a large picture for the Vienna State Opera, called Safety Curtain, while in 2010 she made portraits of South Korean designers, as the part of New York Fashion Week show. These portraits were used to address the issue of gender identity in the world of fashion. Rosemarie Trockel is one of the first female artists of the contemporary German art scene who had a huge influence and power in many different mediums, from painting to video art. The concurrent themes of her work are all bold and important, such as the female role in society, the symbols as social signifiers and also her fascination with various innovative scientific studies, Additionally, Trockel and her amazing skill to incorporate various references to popular culture through logos or symbols is yet another way to comment on the role of art and on the power of subliminal language found in the realms of visual representation. Rosemarie Trockel lives and works in Cologne, Germany. All other images courtesy of Gladstone Gallery.